Gir is one of the principal Zebu breeds, originated as the name suggest, in Gir forests of Gujarat. The breed originally evolved due to sound and consistent breeding efforts of farmers in Gujarat especially from regions, such as, Bhavnagar, Rajkot, Amreli. Gir was also bred in various in Goshalas and farmers from Tonk and Kota districts of Rajasthan. The breed is liked by farmers across the country hence large herds can be found in Maharashtra, Madhya Pradesh, Chattisgarh, Rajasthan, Haryana, etc. Gir has also spread in many western countries, such as Brazil, USA, Mexico, Argentina, etc. 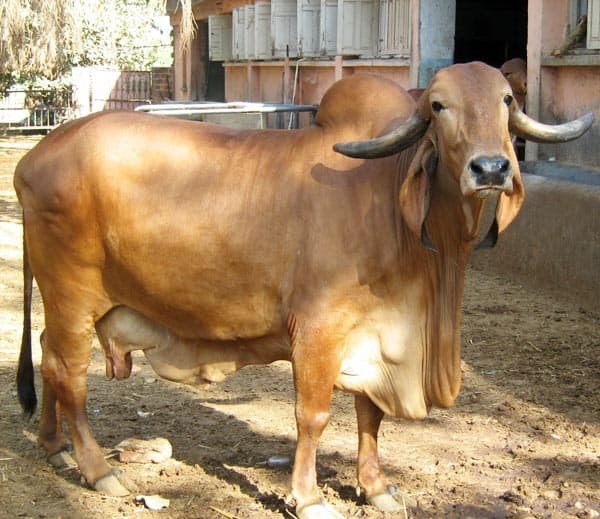 In USA Gir was one of the breeds used to develop a composite Zebu breed by crossing with Kankrej and Ongole (Nellore). The breed is known for its distinct appearance, height and weight and natural beauty which make it very distinct from other. It is a moderate to large size breed. Cows weigh around 400-475 kg (depending upon management practices) and bulls 550-650 kg. In general the body color is shining red to spotted white. Skin is soft, thin and glossy. The Gir cattle are distinctive in appearance, typically having a rounded and domed forehead (being the only ultra-convex breed in the world), long pendulous ears and horns which spiral out and back. Gir are generally have mottled color ranging from red through yellow to white. Black is considered as an unacceptable color. Head shape is the most unique feature of Gir which acts as a cooling radiator to brain and pituitary gland (source of growth and reproductive hormones). Ears are very long and pendulous, opening to the front and resembling a curled up leaf. Horns are set well back on their heads and thick at the base. They grow downwards and backwards with an upward curve. The hump in Gir is considered to be the largest for any Zebu breed. It is very well marbled. Skin is darkly pigmented with short glossy hair, very loose and pliable. They can twitch it anywhere on their body to dislodge insects and have a lot of loose skin around the eye area. Sebum is very greasy and acts as insect repellant. Because of this greasy substance the skin is shiny and refractive to water. The feet of Gir are black and very hard rendering the animal hardy. The sheath is supported by a very strong panniculus muscle on either side. The muscle can raise and lower the sheath at will. Sheaths are very neat and tidy. Gir animals are considered to be the most gentle of the Zebu breeds. In countries like Brazil it has been shown that if Gir cows are kept untied their temperament is docile and they can even be tamed to machine milking like evolved temperate climate breeds. Maternal instinct has been shown to be high as a result, in many countries while milking machine milking, licking by calf is practiced to ease let down. Production and fertility: The average milk production for the Gir in India is around 1500-1600 kg per lactation whereas elite animals have recorded milk yield as high as 4000 – 5000 kg with 4.5 % fat. Gir cows are regarded as pretty fertile since these calve at regular intervals. It is not uncommon to come across Gir animals that have given birth to more than 10 calves in lifetime. Their newborn calves are small in size hence calving problems are uncommon. When well fed these calves post-birth however gain weight quite fast and at weaning these calves weigh as heavy as other Zebu breed calves. Global distribution: Gir being a major milk producing Zebu cattle has received worldwide attention since it has number of desirable inherent features, such as, heat tolerance, resistance to diseases and tick infestation good fertility and production even in adverse climatic conditions. For these Gir breed has been preferred in breeding programs in hot and tropical climate countries. 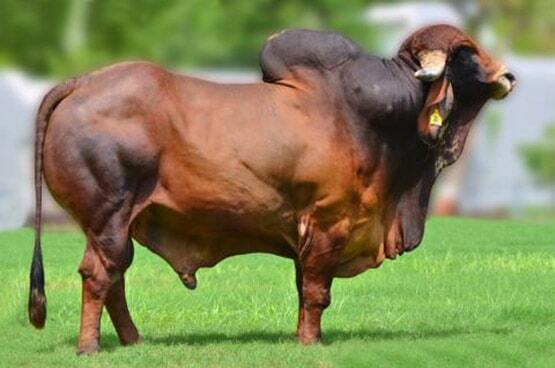 Gir have earned their place as a milk breed once it responded to selective breeding as pure-breed in Brazil. From a moderate size imported herd, Brazil has been able to propagate Gir cattle employing assisted reproductive technologies. Gir has also become popular in Mexico and other countries such as USA, Venezuela, etc. great work! Looking forward for more Indian breed.